This South African evergreen received its name from the Swahili word that roughly translates to aromatic. 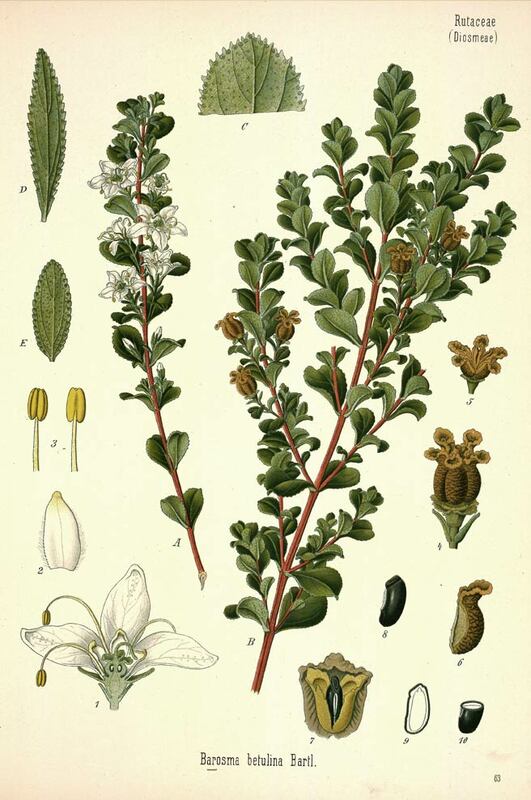 Indeed, the leaves of the shrub have a scent reminiscent of peppermint that becomes more pronounced when dried. While the herb has a long history of use by South African natives, it has many more modern applications. Buchu leaf is a flavoring agent in artificial fruit flavors, various confections, prepared condiments and frozen dairy products. The herb is also used in the perfume and alcoholic beverage industries. Powdered buchu leaf is used to make vinegars, tonics, teas and tinctures, as well as infused oil for topical salves and ointments. Buchu is a small green, woody, evergreen shrub of the Rutaceae family growing to 2 m tall. The leaves are opposite, rounded, about 20 mm long and broad. The flowers appear in Spring and are white or pale pink, with five petals and purple anthers; the fruit is a five-parted capsule which splits open to release the seeds. Buchu has a red-brown to violet-brown bark. The leaves have jagged appearing edges, range in color from yellow-green to brown, and are covered in oil glands that give them an oily, wet appearance. The leaves have a minty, black currant scent. The name Buchu is from Afrikaans boegoe, probably from Zulu bucu, perhaps ultimately of Khoikhoin origin. Buchu is also from the Hottentot word for the plant, bookoo. Buchu is native to the lower elevation mountains of western South Africa. Buchu occurs near streams, slopes, or shrub lands with full sun and in a frost-free climate. Buchu should be grown in well-drained, coarse, gravelly and deep soil. Buchu can be grown from seeds although the collection of seeds does present problems. The flowering season extends over a number of months so that not all the seeds ripen at the same time. Once the seed capsule has ripened, it spontaneously splits open shooting the seed out in every direction. If,	however, the seed is collected before the capsule has ripened, the seed will not be viable. Commercially, flowering shoots are enclosed in cheese-cloth (or pantyhose) to catch the seed when the capsule splits open. Viable seed can be identified by the fact that they sink in distilled water. Buchu leaves are collected while the plant is flowering and fruiting, and are then dried. Dried leaves are cut into small pieces or powdered, and stored in airtight containers in a cool, dry place. Diuretics deplete body stores of potassium, an important nutrient. Anyone taking buchu should increase consumption of foods high in potassium, such as bananas and fresh vegetables. Pregnant women should not take diuretics without a physician's approval. The Food and Drug administration considers buchu safe, and no harmful effects have been reported. For otherwise healths non pregnant, non-nursing adults who are not taking other diuretics, buchu is considered safe.